I highly recommend reading the earlier part of the Meta Trader 4 Show in case you do not know about excellent Meta Trader 4. 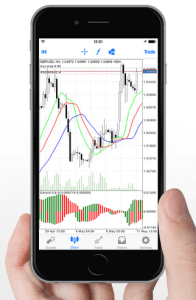 In summary: This application will show you price movements of not only currency pairs but also stocks, indexes, and commodities. Simply put, it is an invaluable assistant in binary options trade. In case you don’t have spare time to sit several hours at your computer and still would like to use Meta Trader 4 while traveling, Meta Trader 4 offers several options for tablets and smartphones. The first and probably the best is – hard to believe, right? – classic Meta Trader 4 for Windows tablets. Yes, this is the traditional Meta Trader that you are used to. What is not so traditional is to run it on a tablet. If you do have, just like me, a tablet with Windows 8.1 or newer, you can install an ordinary version of Meta Trader from our website and use any indicators and templates you wish. The situation is worse for users of other tablets. The official Meta Trader application is offered even for these operating systems. It’s main disadvantage is that it does not support all indicators and templates. You can use trend lines and all other preinstalled tools, but not downloaded custom indicators. You can download this application from Google Play or App Store for any Android or iOS-based device. Somewhere I’ve read that Meta Quotes (Meta Trader developers) are not planning extending functionality and adding an option to load custom indicators. The reason they give is that their users are satisfied and there’s no need for change. Is there any alternative to MT4?